I found this madeleine recipe in the Susan Loomis book Tarte Tatin. This book and On Rue Tatin tell the story of Susan's life in a Normandy village where she runs a cooking school. Susan is living the life of my dreams. From beginning to end both books are a great read with wonderfully descriptive chapters. There were moments I felt I was right there renovating the old house, enjoying a meal in the garden, cooking with Susan. 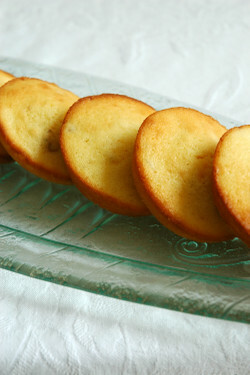 The madeleines are quick, simple and a delightful bite with an herb tea morning, afternoon or evening. Melt butter with grated ginger over low heat. Add minced (or finely diced) ginger. Whisk eggs and sugar together in a large bowl until thick and pale. Fold in flour and ginger mixture. Fill buttered pans 3/4 full with mixture and refrigerate 30 minutes. Cook at 220C 7 - 8 minutes. Turn out and serve warm with herb tea. I don't own any madeleine tins so have used a small patty cake pans. The cakes have a very slight hint of ginger. Next time I think I will add a little extra ginger to make them a little stronger.